Whether from the UK or our 3 Mediterranean bases, from Palma to Turkey, Sunbird can fulfil your new boat. 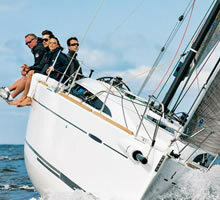 The UKs longest established Beneteau dealer, we are experts in the market leading Oceanis, Sense and First models. For the powerboat field Greenline dealers at the forefront of the new direction for environmentally sensitive powerboating. On the powerboat side the ranges include Swift Trawlers for the cruising powerboater to the glamorous Gran Tourismos and the luxury of Monte Carlo Yachts. Our head office is open seven days a week please contact us if you would like some advice about any aspect of buying a new boat or if you would like to arrange a viewing of a particular model we usually have a large selection at our home base in Clyde Marina.